1. 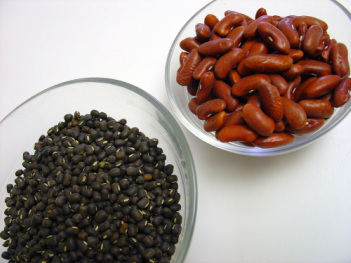 Clean, wash and soak the whole urad & red kidney beans or rajma overnight. 2. Drain, add 2 cups of water. Add salt, some crushed ginger and pressure cook mid-high for 7 whistles or till the dals are overcooked. 3. Open cooker after releasing steam & Whisk till the dal is almost mashed. Keep aside. 5. For the tempering: heat the butter in a deep pan and add the cumin seeds. When the cumin seeds crackle, add the green chillies, cinnamon, cloves, cardamoms. 6. Add onions and sauté till the onions turn golden brown in color. 7. Add the ginger-garlic paste,chilli powder, turmeric powder and tomato puree and cook over a medium flame till the mixture leaves oil. 7. Add the dal, salt and approx 2 to 3 tbsp water if required and simmer for 10 to 15 minutes. Add little garam masala. 8. Add the cream and mix well. Simmer for 2 to 3 more minutes. 9. Garnish with coriander and fresh cream. 10. Serve hot with chappatis or Rice. Here is a delicious Dal made of Black whole urad lentils & Red kidney beans or Rajmah. It is rich flavorful and highly enjoyed by all with rice or Indian breads.